Mace is the crimson or bright red coloured spice. It is used in recipes which are delicately flavoured. Mace should be added at the beginning of cooking in order to develop its full flavour. It gives a light orange hue to the recipes and can be used in cooking sauces, curries, pickles and ketchup. Buy Javitri online at best price from KiranaPlace, a online spice store in India. Mace and nutmeg are derived from the same plant. Mace is the crimson or bright red coloured spice or condiment, present as the second membrane covering the seed of the nutmeg fruit or the nutmeg. Mace spice also known as Javitri in India. Mace characteristically compose higher concentration of certain essential oils and features refined yet intense aroma than nutmeg. Mace's main constituent is 7-9% of a volatile oil, along with resins, protein, gum, fixed oils and sugar. Mace is one of the natural boons. Mace can be used in several forms, either as the dried lacy covering or in powdered form. Mace contains several essential minerals such as copper, potassium, calcium, manganese, iron, zinc and magnesium. Mace is extremely rich in important B-complex vitamins, vitamin C, folic acid, riboflavin, niacin, vitamin A and many flavonoid anti-oxidants like beta carotene and cryptoxanthins. Its versatile flavor makes it an important ingredient in various dishes to enhance the taste and bring out the color of the food. Mace has always been utilized to deal with digestive problems like nausea, diarrhea, stomach spasms and gas. Potassium present in mace is significant for controlling heart rate and blood pressure. Mace also offers mild anti-anxiety and sedative properties. Mace is beneficial for treating kidney infections and kidney diseases. Mace is highly effective at combating bad breath because of its antibacterial properties. Mace spice helps to enhance the circulation of blood in body. 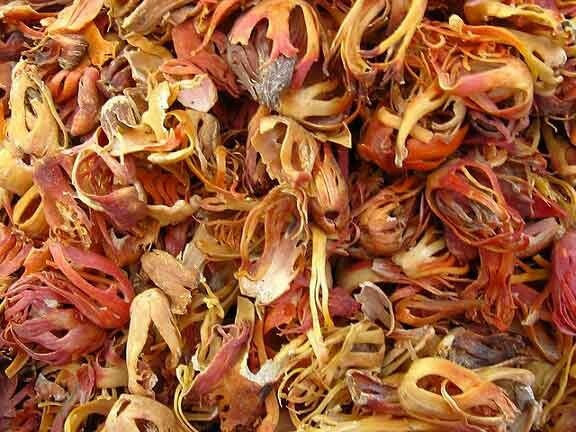 In some traditional medications (Chinese and Indian), mace has been utilized to deal with nervous system illnesses. Mace spice may also handle cold and cough.